These trends reflect what U.S. military officials call a stalemated war, more than 17 years after U.S. forces invaded following the Sept. 11, 2001 attacks. Meanwhile, talks between Washington and the Taliban continue over the possible withdrawal of foreign troops. The negotiations, due to resume in Qatar on Feb. 25, are centered on a possible ceasefire and the withdrawal of thousands of U.S.-led NATO forces. Many obstacles remain before that would be possible but an eventual pullout would place the Afghan defense forces under even more pressure. Gauges of battlefield momentum have changed little over the past year, according to a watchdog agency known as the Special Inspector General for Afghanistan Reconstruction (SIGAR). In a report to Congress on Thursday, it said the Afghan government controls or influences 54 percent of districts, down from 56 percent a year earlier, and the Taliban's share slipped from 14 percent to 12 percent. Contested territory increased from 30 percent to 34 percent. Amid reports that President Donald Trump is considering withdrawing as many as half of the 14,000 U.S. forces in Afghanistan, Afghan President Ashraf Ghani has been publicly emphasizing the sacrifices his troops are making in fighting the Taliban. Ghani was reported to have said at the World Economic Forum in Davos, Switzerland, last weekend that 45,000 Afghan security personnel had died since September 2014. "That number indicates that in those roughly 53 months, around 849 Afghan security personnel have been killed per month on average," SIGAR said. President Barack Obama ended the U.S. ground combat role against the Taliban at the end of 2014 while focusing more on training and advising Afghan forces. Some 8,000 troops from 38 other countries also participate in Resolute Support, the U.S.-led NATO mission in Afghanistan. The heavy losses suffered by Afghan forces partly explain why Kabul is unable to build its army and police to their authorized strength of a combined 352,000. 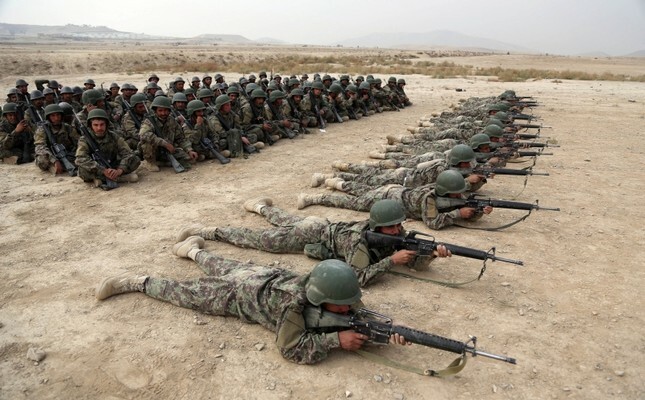 Thursday's inspector general report said the army and police are at a combined total of 308,693 troops, or 87.7 percent of its assigned strength, the lowest since the creation of NATO's operation to train, advise and assist Afghans in January 2015. This figure is also down from 312,000 a year earlier and nearly 316,000 in 2016. The cost of arming, training, paying and sustaining those forces falls largely to the U.S. government at more than $4 billion a year. SIGAR also released figures suggesting the recruitment and retention of women in the national defense and security forces was a significant challenge. Citing information declassified by U.S. Forces-Afghanistan, SIGAR said Afghan forces had 4,735 female personnel - less than 2 percent of current assigned strength. However, the Taliban have so far refused another key U.S. demand -- that they talk to the internationally recognized government in Kabul, which the insurgents view as American "puppets." Acting Defense Secretary Patrick Shanahan said Tuesday that he saw "some very encouraging possibilities" in Khalilzad's negotiations. "But we need to give them time and space," Shanahan said. Ryan Crocker, a former US ambassador to multiple nations including Afghanistan, said in an opinion piece in The Washington Post that U.S. negotiations with the Taliban are akin to "surrender." "The Taliban will offer any number of commitments, knowing that when we are gone and the Taliban is back, we will have no means of enforcing any of them," Crocker wrote.